Woops! The embarrassing part is I bought another pair of eyelashes (3 for 2 obvs) and a bottle of fake tan! However these are all products I've used before/ mentioned in my posts so I thought I'd show you new things I'm trying. Few the next few weeks I will be reviewing each of the products as I use them. I haven't tried this style eyelash before with the pre glue so I'm interested to see how it works out. So I actually managed to get a few good deals with the above pieces. After getting my wax (in the painful place) the lady noticed I had a few ingrown hairs and asked if I had been exfoliating around there area (sorry for the TMI!) but she recommended the outback organics face and body scrub. I've used products from this range before- and know they are good- so I thought why the heck not. It's all natural and very gentle so I can use it for my face too. It's cheaper then my usual soap and glory one and on top of that the salon were doing 20% off for students, costing me just £7.20. 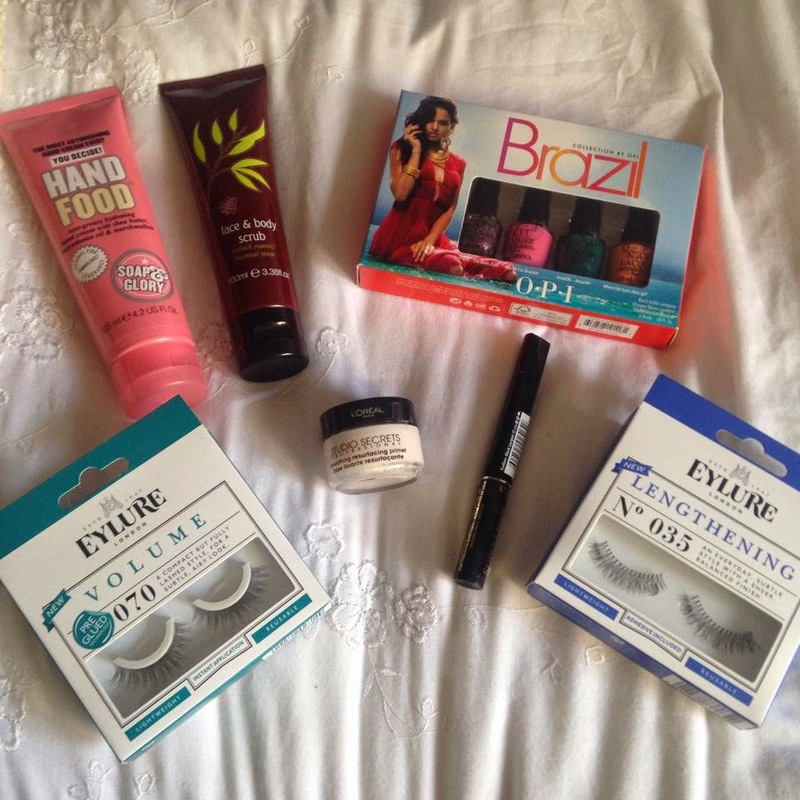 The next bargain (this was a bit cheeky) were the Loreal Primer and Eyeliner. Originally I had gone into buy both the Lancome Art liner and Primer but when the lady showed me another type of primer to the one I usually use, it threw me and I didn't know which one to invest in. She gave me a free sample of the one I'm not used to so I can give that a whirl. I then asked for the eyeliner but alas they were out of stock....... knowing loreal was made by the same people I popped over to that counter to see what I could find. They had an offer on for 2 for £14, but this excluded their primer. Their studio secrets primer felt identical to the one Lancome sells and so, even though this wasn't included in the deal I picked it up and went for the eyeliner which also seemed to be a copy. I didn't go for the 2 for £14 because a deals only a deal if you wanted it to begin with right? This paid off massively as when I went to the self checkout there was clearly a mistake and I managed to bag the two for £14 anyway! How lucky is that?! Hoping these will make great dupes. Basically I picked up hand food as it was on a fancy display to look at, it then hit one and the whole display fell over. I then felt obliged to buy it. The Opi nail varnish kit I actually won in a work raffle, so that made my day significantly better. I love OPI very much but now I am using the gel polish and it can last about one month. It is perfect for lazy people like me. Lol! Thank you for visiting my blog!